Final Fantasy XIII saw its release on PC yesterday and well… it’s not pretty. User response has been lukewarm at best, with much controversy aimed at the game’s lack of video options – a typical PC staple. The port seems to be based off a mix of the 360 version, according to fans who spent time digging around in the game’s source files. While it does run at a variable 60 frames per second – a jump over the console version’s 30 frames – the PC version comes locked at 1280×720 resolution with no further options present in the game’s menus. Despite its hefty 60GB install size, graphics adjustment options also appear to be absent and the game’s video sequences suffer more compression artifacts than the original PlayStation 3 version, according to reports on NeoGAF. Other curious inclusions center around questionable keyboard mapping and the absence of language options once you boot into the game. Both Japanese and English audio, however available, can be selected from the PC launcher window. Thankfully, modder Durante who is behind the PC resolution enhancement tool GeDoSaTo has taken the case and released a pre-alpha version which allows upping of resolutions and other enhancements. The mod itself is still early – after all, Durante did get it up within a matter of hours following the game’s release – so expect things to be rough with it for just a bit. According to Durante, image output currently isn’t as sharp as it could be and missing HUD elements and blurry cutscenes should eventually be adjusted given time. We tried out Durante’s mod ourselves and while shaky for the moment, it seems to be getting the job done. If you’re eager to replay this version, the final release of his fix is probably going to be the best option. In our other tests, forcing anti-aliasing and depth of field options through a video card’s graphics control panel also helped but is ultimately a band-aid fix for something that could have been there in the first place. 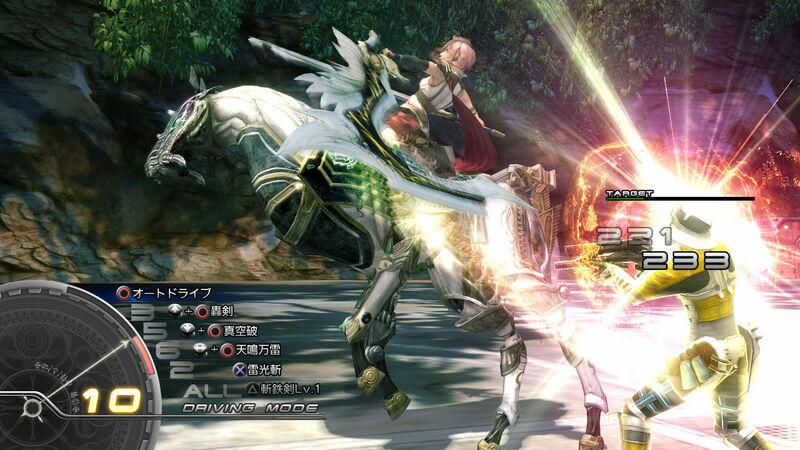 Square Enix plans on releasing Final Fantasy XIII-2 and Lightning Returns: Final Fantasy XIII on PC as well. Both titles should be out by Spring 2015. Posted in Final Fantasy XIII. #PS3Fanboy I don’t see why it matters…. Based on the Xbox 360 version? That explains why the game doesn’t look as good as it does on PS3. The colors aren’t as vibrant and the characters look a lot edgier. Also, there’s a lot of frame rate drops sometimes, something that’s almost none existent on PS3. So far, the best feature that can lend you to play this version is the chance to play it on Japanese. That’s what made me buy it, at least. I still can’t believe that it takes up 60GB of space… That much space is really precious for someone like me that keeps their entire life backed into their laptop. I was hoping to purchase it, but since I already have a physical copy, I guess it won’t hurt not to buy it. I was just hoping I could legally smash a bunch of FF games into my trusty laptop, but I’ll just skip XIII. What I’m REALLY waiting for anyways is IX. Lol, ok. So the version you can’t bring the most out of is the better version? I prefer 60fps. Ohh no no, I really like that its 60 FPS. But looking like the 360 version? On PC? Ffs that’s just sad. I know what you mean. I have a bunch of movies and anime on my computer that take up most of the space. 60 GB for one game is ridiculous. I mean that is precious anime space FFXIII is taking up! It’s nothing more than a port. Don’t expect much. I was watching someone streaming the game on Twitch and the ground texture is like doo doo while the character models looks detailed. LOL This version is sad. Man, this game gets it so hard. People complain since day one. Given up on XIII? For me it’s just the opposite. Al right, they made there mistake with this release, but you can also say: now we got a port to the PC. And during last E3 they where talking about those (JP only) books about XIII. So no, I think the have not forgotten about XIII at all. No, more like they just ported it without any effort for the PC to make money. Have you noticed they kept the graphical limitations of the game in the hush hush before and after release just for unfortunate buyers to find out? If they really cared, they would have optimized it properly for the PC. Lets see what happens to XIII-2 and LR. This doesn’t help the negative press the game gets, and I REALLY like the game. So far I’m just dealing with the game without the mod, but once it gets better I’ll certainly download it. So it’s pretty much like their Dragon Quest X 3DS port??? *sigh*…. Cannot hide the contempt. Lol. But yeah, the highlight of this article should be the mods and fixes being done by the community. Specially Durante’s, which seems to be a godsend. Not everyone has your infinite capacity for forgiveness, Lord.